This 1957 film tells the story of Professor Frankenstein (Whit Bissell), an English scientist who comes to America and promptly sets about trying to create his own creature. I guess we shouldn’t be surprised, considering that his name is Frankenstein and all. Anyway, the professor is lucky enough to come across a fatal car crash. This supplies him with exactly the dead body that he needs. He takes the corpse to his laboratory where, with help of some spare body parts that he just happened to have lying around, he manages to bring the dead teenager back to life! Yep, Teenage Frankenstein is definitely not ready for his public debut. No one’s happy about this. Not the professor. Not the professor’s assistant. Even the professor’s secretary is upset about what’s going on in the laboratory. Not even the alligator that Prof. Frankenstein for some reason keeps around the lab is particularly happy about how the operation turned out. What’s a Teenage Frankenstein to do? Well, he can always sneak out of the lab but, whenever he does, it seems like someone inevitably ends up dead. Obviously, Prof. Frankenstein is going to have to find a new face for his creation but from where? Well, luckily, there is a lover’s lane nearby…. Teenage Werewolf and Teenage Frankenstein, posing together for a publicity shot. 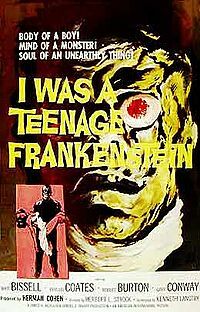 I Was A Teenage Frankenstein was produce by American International Pictures to capitalize on the success of I Was A Teenage Werewolf. (Whit Bissell plays a mad scientist in both movies and gets the best line in It Was A Teenager Frankenstein when he yells, “Answer me! You have a civil tongue in your head! I know, I sewed it in there!”) Unfortunately, while the monster makeup is indeed impressive, I Was A Teenage Frankenstein is never as much fun as I Was A Teenage Werewolf. While the teenage werewolf had an entire town to explore, Teenage Frankenstein is pretty much stuck in that lab. 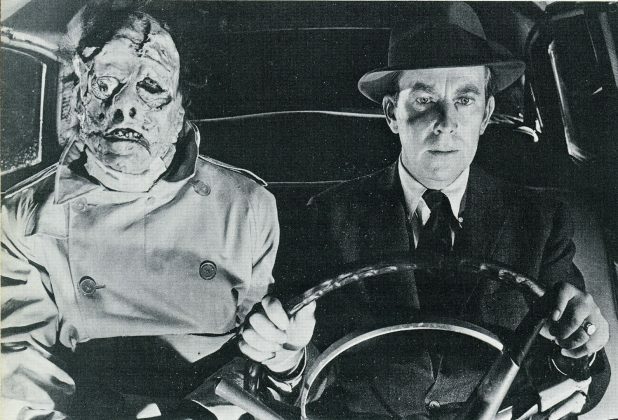 Whereas the teenage werewolf spent his movie running wild, Teenage Frankenstein spends all of his time doing whatever the professor orders him to do. As a result, I Was A Teenage Frankenstein is a much slower film and also lacks the rebellious subtext of I Was A Teenage Werewolf. 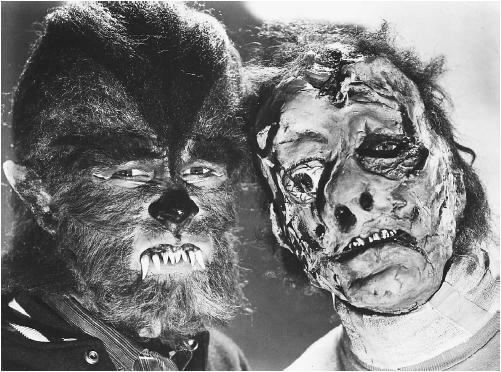 That said, I Was A Teenage Werewolf was enough of a box office success that both the werewolf and the Frankenstein makeup were later used in How To Make A Monster.